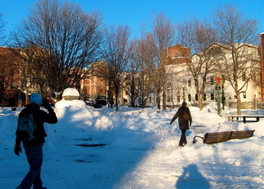 It's a little after 7 a.m. and +3 degrees in Burlington, Vermont. Listening to Roger Hill give the weather on WDEV as only Roger Hill can. That's a shot taken yesterday afternoon of the fountain in Burlington's City Hall Park. The days of the long shadows, eh? Roger says sunshine this morning, too! Take it when we can. It's an "Inside Track" Tuesday here in Freyne Land. Lot of balls in the air. Was just thinking....that first "Inside Track" hit the street in 1981, soon after that Bernie Sanders fellow took over the mayor's office in city hall.